Actor and gun enthusiast Charlton Heston died at the age of 84 on Saturday. His excruciating interview in Bowling for Columbine caused a hellacious controversy, even by Michael Moore's standards. Awesome picture! 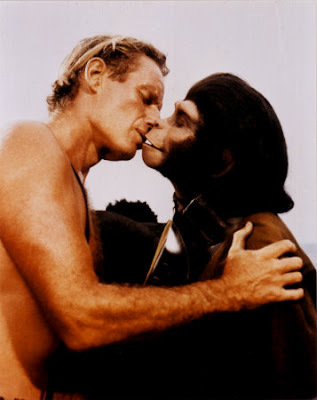 Take your stinking paws off me, you damned dirty ape! Has anyone pried the gun out of his cold dead hand yet? I would like that job. A classic line, often repeated on Delmar Street near Civic Park when Jerry Gawne, Mark Rudolph and I used to play Planet of the Apes. And as you can see from the photo, Charlton grew to love his enemy. He didn't need to gun them down.